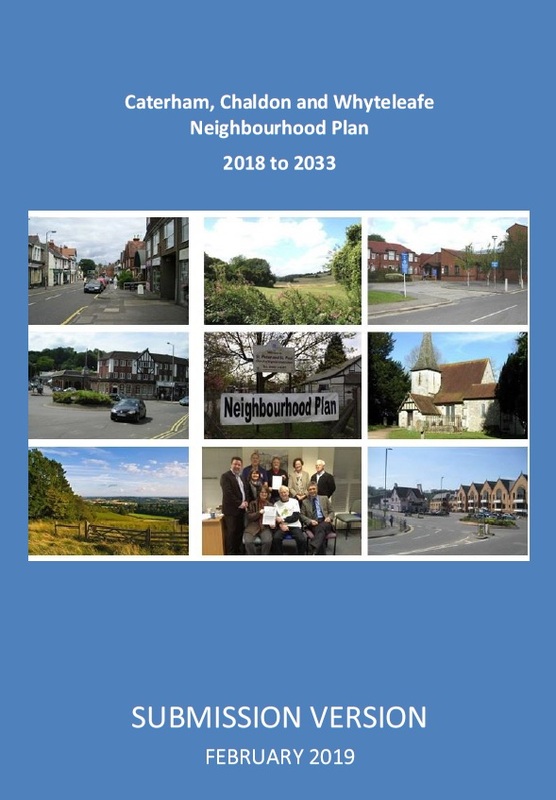 The Caterham, Chaldon and Whyteleafe Neighbourhood Plan (CCWNP) has been a collaboration of many residents and local groups with input from local businesses. The policies in the document have been drafted to address the challenges that face Caterham and the surrounding area. The vision of the CCWNP is for a prosperous local economy with successful businesses with high quality jobs and a skilled workforce, for thriving local centres with an eclectic mix of local and national shops. At the heart of this Plan is the principle of sustainable development with quality architecture, which is about change for the better. The objectives of the CCWNP relate to defining and protecting Neighbourhood Character Areas and promote development within them that respects their integrity. It supports sustainable housing development with a range of design and size that will provide for the whole community. It encourages the development of infrastructure and services, which will support existing and new development including a range of community, leisure, cultural and educational facilities in locations that are accessible to the local population. It strives to promote reliable and regular public transport that serves all areas of the community and promote quality employment through the encouragement of flexible business, retail and service centres, including the provision of attractive public spaces. While the CCWNP supports development, this area has seen significant housing growth in recent years. Additional house-building needs to be done in a way that protects the rural setting and historic character of the area with family homes – including affordable homes – needed to continue to meet the needs of families attracted to the area. Caterham has been the recipient of a significant proportion of new housing developments within Tandridge in recent decades. The CCWNP area has consistently delivered over 40% of new housing in the District over the last 12 years (averaging 120 homes per year), and this has created additional pressure on local services, amenities and infrastructure. There is a need to revitalise the retail areas to make sure they are vibrant and continue to attract both residents and visitors. However, traffic congestion is high, exacerbated by public transport services with infrequent buses and overcrowded trains, particularly at peak times. Public car parking, particularly near to the railway stations, that is primarily off-street, needs to be provided to improve accessibility and to ease congestion and commuter parking along residential streets. A key priority for residents is access to healthcare, and there is a need to extend the existing surgeries or expand provision to meet the increase in population. The CCWNP believes that more educational facilities, such as primary schools and expanded secondary schools, will be needed as the population grows. Employers have stated there is a lack of starter units and low cost, flexible workspaces. The amount of office space in the area is dwindling. This is discouraging of local employment, while population increases. The developer asserts that this proposed type of development has worked in other areas. However, the areas that they have listed are Epsom, Guildford etc, which have much better transport facilities. As a very small town, we should not be used as a comparison. The CCWNP Steering Committee does not believe this proposed development takes these factors into account and are disappointed that despite consultation, the views of residents and local groups have been ignored. The CCWNP Steering Committee completely agrees with, and supports, the Caterham Flood Action Group (FLAG) and the comprehensive concerns they have in relation to flooding and over extension of the drainage capacity with no additional infrastructure regarding this development. These concerns cannot, and should not, be ignored. The developer has said that they have consulted local groups and they have referred to the draft TDC Local Plan, which does not specify density and has referred to the Caterham Masterplan, which also does not specify densities. The developer has referred to the Caterham Town Design statement, yet does not consider the recommendations in this document in relation to this application. The CCWNP Steering Committee believes this proposed development contravenes many of the draft policies in the CCWNP, specifically relating to Housing, Infrastructure including the concerns regarding flooding, lack of transport facilities and the severe lack of parking in the local area. Housing development must contribute to meeting the existing and future housing needs of the Neighbourhood area. Local consultation and evidence has identified a need for the provision particularly of one, two and three-bedroom dwellings at lower to median local cost, suitable for occupation by single people, young couples, small families and the elderly in suitable locations, particularly in or close to public transport and other amenities. In particular, there is a desire to see new houses, as opposed to flats/apartments, unless suitable and adequate amenity space is provided. The CCWNP Steering Committee would assert that this proposed development does not address the issues in this policy. This proposed development is a large one for the area and, with the number of units that the developer is anticipating to build, there is an insufficient mix of housing on this development. New development must be of a density appropriate for, and in keeping with, the setting of the immediate surrounding area, using the Urban Capacity Study (2017) and any subsequent update as a baseline guide, and in accordance with Policies CCW8 and CCW9 of the CCWNP. Where an area is not covered by the Urban Capacity Report, density levels will normally be in the range of 30 to 55 dwellings per hectare, and in accordance with Emerging Local Plan Policy TLP19 and the policies in the CCWNP. Higher optimised net density, up to 75 units per hectare, may be considered for developments on suitable sites that provide lower to median local cost housing in house units of 1, 2 and 3 bedrooms or which meets a specific local need, as set out in Policy CCW3. Subject to high quality design and compatibility with its immediate environment and local character, in Town Centre areas a net density of up to 100 units per hectare may be supported. The CCWNP Steering Committee is of the view that this proposed development does not address the issues in this policy. We consider that the current development proposal is of poor design quality and is incompatible with the immediate environment and local character of the area. The CCWNP wishes to conserve and enhance our distinctive local character and heritage so that its significance may be better understood and appreciated. The Design Guidelines prepared to support our plan and published last year give details of what makes our area special and the preservation of character is necessary to sustain valuable aspects of our community. Development is expected to preserve and enhance the character area in which it is located. The design of new development should take account of the local context and reflect the character and vernacular of the area, using architectural variety in form and materials, in order to avoid building design that is inappropriate to the Plan area. Innovation in design will be supported where this demonstrably enhances the quality of the built form in a character area. Density of development should be in accordance with Policy CCW7 of the CCWNP. Development proposals affecting heritage assets – including non-designated heritage assets – either directly or indirectly, should respect the significance of and context of the asset and demonstrate how they will contribute to the conservation and enhancement of the heritage asset. However, many locally significant heritage assets are vulnerable because they are not officially recognised or designated. Historic features may be buried or otherwise concealed. Evidence should therefore be used to assess the potential (NPPF: 187-190). Piecemeal losses can have an increasingly negative impact on characterful neighbourhoods, streetscapes and frontages. Demolition is often easier than considering the opportunities to restore and re-purpose character buildings so that they are given a new lease of life. The CCWNP Steering Committee is of the strong view that this proposed development does not address the issues in this policy. This proposed development does not preserve or enhance the character area in which it is located. There is no architectural variety in the design. It affects the local heritage assets and will have a negative impact on the character of the area. The current look and feel of Station Avenue, for example, has been a notable feature of Caterham Valley for generations and the proposed development will remove it and replace it with buildings of very poor architectural merit. It is important that new development reflects the character of the Neighbourhood area and the design of residential properties demonstrates that they look and feel like local properties. Development is expected to demonstrate a high quality of design, which responds and integrates well with its surroundings, meets the changing needs of residents and minimises the impact on the local environment. Development proposals will be expected to demonstrate how they have sought to provide off-road parking for residents, visitors and service vehicles, in accordance with the adopted Tandridge Parking Standards (2012) and to ensure that traffic generation and parking does not adversely affect vehicular and pedestrian safety. The Design Statement recommendation has been completely ignored by this application as the buildings are planned to be demolished and replaced by a monolithic, very low quality functional development, which does nothing to enhance or improve the character of the town. The demolition of the current facades of the Station Avenue shops is therefore not supported. The CCWNP Steering Committee would assert that this proposed development does not address the issues in this policy. This proposal does not reflect the character of the Neighbourhood area. It does not provide sufficient parking for residents, visitors and service vehicle in accordance with TDC’s Parking Standards 2012 and it certainly does not enhance or improve the character of the town. Whilst there are significant concerns about the scale and detail of development proposed, the vision for a mix of uses, which will encourage footfall throughout the day and into the evening, is generally supported by the CCWNP. However, development proposals within or immediately adjacent to the defined Caterham Valley town centre and local centre must encompass the need for sustainable development. There is a need to maintain the economic health, vitality and viability of these areas in balance with residential development and infrastructure. In particular, development proposals that have the potential to provide public realm improvements, improve vehicular, pedestrian and cycle movement within the Town Centre and help to tackle issues identified by the evidence and analysis in the CCWNP supporting documents, should consider and address those opportunities as part of their scheme. Within the smaller local and neighbourhood centres, the CCWNP supports the continued provision of retail but also welcomes diversification of use, particularly of office space, as expressed in Policy CCW11. As well as their commercial role, the contribution that these neighbourhood centres make to the quality and character of the Neighbourhood area is valued. Therefore, any new development or redevelopment is expected to demonstrate a high quality of design, and should make a positive contribution in the Town. The scale and detail of this proposed development gives cause for a great deal of concern. The CCWNP Steering Committee strongly believes that this proposed development does not address the issues in this policy. There is no mix of uses. We do not believe that it will maintain the economic health, vitality or viability of the area in balance with residential development and infrastructure. It does not demonstrate a high quality of design nor does it make a sufficiently positive contribution to the town. Development proposals are required to ensure that they do not have a significantly detrimental impact on the locally significant views. This proposed development will have a significant impact on CAV18 – Caterham Valley Town Centre from Commonwealth and Mount Pleasant Roads looking South. Proposals which provide, enhance and facilitate the continued delivery of health facilities at Caterham Valley general practice surgery will be supported. However, development proposals should not have significant harmful impacts on the amenities of surrounding residents and the local environment or unacceptable impacts on the local road network. The CCWNP Steering Committee would assert that this proposed development does not address the issues in this policy. We expect a development of this size to enhance and facilitate the continued delivery of health facilities. We consider that the provision of health services has not been fully explored by this application. Development is expected to not have an unacceptable impact on Key Movement Routes, and provide a strategy to mitigate the impact of additional traffic movements on the safety and flow of pedestrian access. The CCWNP Steering Committee is of the view that there is not enough information provided in this application to address the impact of additional traffic movement on the safety of pedestrian access. There is insufficient information on the impact of traffic, particularly from and onto Harestone Valley Road and Station Avenue. Whilst active travel on foot and by bicycle has health as well as transport benefits, movement by public transport is also key to people being able to get around effectively and to reduce vehicle use. This is particularly so for those without access to a car, but wishing to travel a longer distance than walking or cycling might allow. This policy seeks to ensure that adequate public and community transport options are offered. The CCWNP Steering Committee notes that there is insufficient information on public transport routes and capabilities in this application. Whilst the CCWNP predominantly seeks to encourage sustainable modes of transport, the area does have high car ownership and is a popular destination for those choosing to drive to the railway stations to commute out to work. The issues of car parking, and particularly the availability of parking spaces is a serious concern among local residents and this policy seeks to ensure that there is adequate off-road public car parking for those working, shopping or visiting the Neighbourhood area. There is a forecast growth in the number of people choosing to travel and commute by train. The decision to include the local stations in Transport for London’s Fare Zone 6, makes it attractive to drive into Caterham and Whyteleafe to benefit from lower fares. Consequently, available station parking is filled for the day during the morning peak, presenting a disincentive to off-peak leisure travel by train and to local professionals wishing to make off-peak, business-hour journeys. The leisure travellers’ difficulty is compounded by the lack of buses after early evening to return rail passengers from the Valley to the Hill. It is essential to retain, manage and improve the quality of publicly accessible car parking areas, particularly within walking distance of the railway stations. In addition, to consider where additional public car parking might be developed. This is important for the continued economic prosperity of the settlements as well as the convenience of residents, workers and visitors. There is a presumption against the loss of publicly accessible off-street car parking in the Caterham area. Any proposals that would result in the loss of existing publicly available ‘off-street’ car parking spaces must provide at least an equivalent number of spaces in an equally accessible location. Proposals for new development that provides additional public off-road car parking spaces, in particular next to businesses and at transport hubs, will be supported. The CCWNP Steering Group has consulted widely with residents in the last few years and the lack of car parking on local roads and in the local area has been a primary concern. Available station car parking is full during the morning peak times. This proposed development does not manage or improve the quality of publicly accessible car parking spaces, nor does it provide sufficient additional public / resident off-road car parking spaces. With a density of 178 units and the potential of 480 people, this application will exacerbate existing parking issues. The CCWNP believes that new development should be integrated into, and well connected to, the local infrastructure network – including communications, transportation and utilities – and for adequate utilities and infrastructure to be in place. All necessary community, transportation and utilities infrastructure must be provided for new developments. The CCWNP Steering Committee believes that this proposed development does not address the issues in this policy. This application has not dealt adequately with the impact of this development on utilities or potential flooding issues. The full impact on the local transport or infrastructure has also not been adequately explored. The CCWNP expects to be classified shortly as an emerging Neighbourhood Plan. It has been drafted following extensive consultation with local residents and it is therefore essential that the views expressed in CCWNP response to this application are considered as part of the decision making process. The CCWNP Steering Committee requests that this application, in its current form, be refused. All documents relating to the CCWNP can be found at https://ccwnp.org.uk/. Join our mailing list to receive the latest news and updates about the Caterham, Chaldon & Whyteleafe Neighbourhood Plan.